We call this the “Fidget Ring” because once we put in on our finger we couldn’t stop fooling around with it. It is really two rings…an inner ring and outer ring. The outer ring spins easily around the inner ring. Try it. You’ll see why it got it’s name. 36 rings. 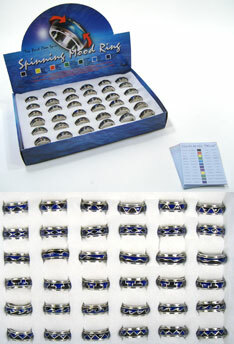 Rings are assorted sizes and non adjustable. $92.70 per card (36 pieces). $64.80 per card for 2 cards or more. $57.65 per card for 4 cards or more.